The outbreak of the Zika epidemic in 2015 and the birth of affected babies with congenital Zika syndrome (CZS; microcephaly and other associated malformations) created an alert among Brazilian scientists. In 2016, it was reported that the Zika virus (ZIKV) has tropism towards neuroprogenitor cells (NPC) causing neurodevelopment abnormalities in babies exposed to the virus during pregnancy. Since the vector (Aedes aegypti) is prevalent in most of the Brazilian territory, including densely populated urban areas of the Southeast, most pregnant women were in panic. Despite the tragedy behind each affected baby, in the beginning of 2016 it was observed that most women (about 90%) who had been infected by ZIKV during pregnancy delivered normal babies. What could we learn from this observation? Are there mechanisms protecting NPC in non-affected babies or an increased susceptibility in those who developed CZS? One way to find it out would be to compare a large cohort of affected and non-affected babies who had been exposed to ZIKV during pregnancy. Clearly, it was not an easy task. How to ensure that the mothers had been exposed to the same environmental conditions? Or, that different ethnic backgrounds could influence the outcome? Could babies born from mothers who had been previously infected with other virus such as dengue or chikungunya had an increased risk of developing CZS? 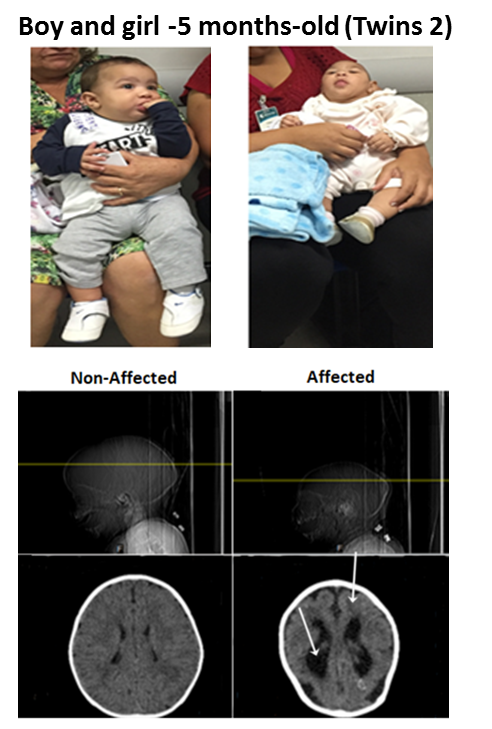 While we were debating all these questions, it was reported in the media, by Dr. Vanessa van den Linden from Recife (Pernambuco - Brazil), that the first case of CZS was identified in a pair of dizygotic (DZ) twins. Surprisingly, only one of them was affected. This information turned on “our light”. As geneticists, we know that twins’ studies are the best approach to circumvent confounding variables. Considering that CZS would depend solely on the environment (i. e. the Zika virus infection) we would expect dizygotic (DZ) and monozygotic (MZ) twins to be equally affected. However if a genetic contribution increases susceptibility to develop CZS, we would expect discordant DZ twins (one normal and one affected) and a higher concordance among MZ than DZ twins. With this in mind, we travelled to different Brazilian States where CZS cases had been reported to search for newborn twins. We intended to examine them personally. Among 91 CZS newborns, we identified nine pairs of twins from different Brazilian regions with at least one affected baby: seven DZ and two MZ. The two MZ pairs of twins were concordant (both affected) but six among the seven DZ twins pairs were discordant. This distribution was compatible with our hypothesis of a genetic predisposition increasing the risk for CZS. We knew that ZIKV infects and impairs NPCs growth but there were no reports on NPCs derived from affected babies exposed to ZIKV in vitro. The possibility to compare the outcome of ZIKV infection in NPCs derived from discordant twins would be extremely interesting but obtaining such samples would be a great challenge. First, we had to explain the parents (usually the mother) that the twins participation in this project would not bring them any benefit, particularly to the non-affected ones. And second, we had to guarantee that blood samples taken from babies living in distant villages would arrive in our laboratory in good conditions to derive induced pluripotent stem cells (iPSC). But due to the enormous interest we thought it would be worthwhile making every effort to achieve it. If NPCs derived from affected babies would be more susceptible to in vitro ZIKV infection this would support our hypothesis of a genetic contribution protecting normal babies or increasing NPC susceptibility in the affected ones. On the other hand, if NPCs derived from CZS and non-affected infants would respond equally to ZIKV infection, our hypothesis would not be confirmed. Eventually, we were able to obtain samples and derive NPCs from three pairs of discordant twins. 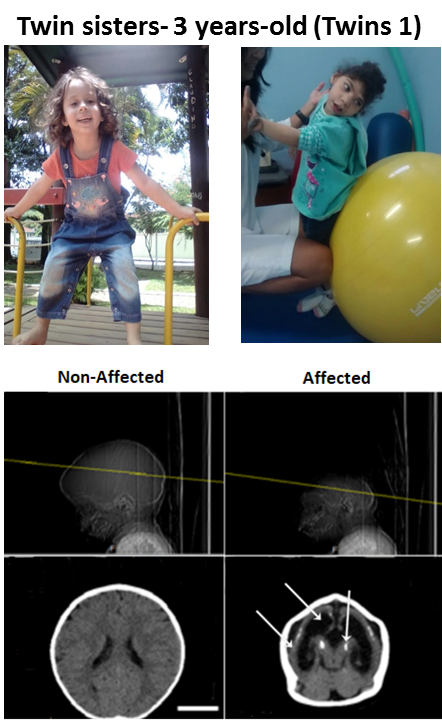 No decrease in cell proliferation prior to in vitro ZIKV infection was observed in NPCs from affected twins as compared to the normal ones suggesting that, if the affected twin had not been infected by ZIKV, most likely his/her neurodevelopment would not be impaired. Next, we infected with ZIKV the NPCs from these six babies in the same laboratory conditions. What was observed then? ZIKV replicated and reduced cellular replication in affected NPCs significantly more than in the normal babies supporting our hypothesis. We were very excited. Results “in vitro” seemed to replicate what happened “in vivo”. Could genetic/epigenetic factors explain such differences? To address this question, we analyzed global gene expression profile in the three non-affected as compared with the three affected twins and confirmed there were significant differences in key regulators of neurodevelopment and regionalization. Interestingly, such differences in the gene expression programs were observed in NPCs cells prior to infection. In short, we showed for the first time that CZS is not a stochastic event. It depends on NPC intrinsic susceptibility, possibly related to multifactorial and/or epigenetic mechanisms . Our data sheds lights into Zika molecular pathology and points out new candidate genes that play a role on determining NPC susceptibility against ZIKV. Additionally, the possibility to identify susceptible individuals in a population could represent an important tool in the future to select those who should be vaccinated with priority. 1. Human Genome and Stem Cell Research Center, Department of Genetics and Evolutionary Biology, Biosciences Institute, University of São Paulo (USP), São Paulo, SP 05508-900, Brazil. 2. Butantan Institute, São Paulo, SP 05503-900, Brazil.